Suit 1 - 2 couples or Family of 4 from $200 p.n. Long Weekend in June from $200 p.n. 1st Sept. - 30th Nov." Bayview" Bedroom from $180 p.n. weeknights and from $200 p.n. weekends. 2nd "Gardenview" bedroom just $20 p.n. for 2 singles or 1 couple. 7 nights Weekly only - 1st December to 18th Dec. from $200 p.n, for 1 couple OR 2 COUPLES - $220 p.n. 18th Dec. - to 27th Jan., 2019 $1680 p.w. for 1 or 2 couples of family of 4. With stunning views over Jervis Bay, Sea/Change is a Luxurious Beach Townhouse, RECENTLY REFURBISHED and situated just steps onto Collingwood Beach, Jervis Bay (NO ROADS TO CROSS). The townhouse is fully self contained, beautifully decorated & comfortably furnished. with reverse cycle air conditioning for your comfort upstairs, fans & heaters downstairs & your own FREE WI-FI and free parking. There is also a small garden paved courtyard containing BBQ, and outdoor furniture. The upstairs balcony contains seating for 4 and small table. the views are quite stunning. Suitable for a Romantic Couple, 2 Couples, Business People, or Family of four (4). Off the courtyard is the small villa style garage, suitable for small car or small boat, + bikes. Includes all linen, towels & beach towels, face washers, bath mats, hand towels and tea towels. Also quality wine, delicious chocolates + up to 20% discount on Dolphin & Whale Cruises. Gorgeous 2 Bedroom Beachside Townhouse, comfortably furnished, with toiletries, dishwashing tablets, washing powder. coffee & tea making. "SeaChange" contains 3 heavenly beds and is suitable for 1 or two couples, or family of 4. With Stunning Balcony views and situated just steps onto Collingwood Beach and Bay Bike/Walkway to Huskisson's great cafes, cruises, boutiques and museum, "SeaChange is the perfect location for your City Escape. Go for an early morning swim, stroll along the beach with the dolphins or view the Whales, as you breakfast on the balcony. By evening, with the moon rising over the Bay, enjoy your chocolates whilst sipping your complimentary wine. 2nd Gardenview Bedroom has 1 King Bed for 2nd couple or converts to 2 long singles, for 2 single adults or 2 children. PLEASE NOTE THAT WE HAVE A ''STRICTLY NO PET POLICY". We will forward to you our" Terms and Conditions" Form upon booking., for completion and signature. 1. The townhouse is inspected before and after you leave. 2. Number of guests not to exceed 4. 3. Upon departure, the townhouse must be left as found, clean & tidy. If not, excess cleaning can be up $75. 4. All breakages must be notified. 5. Damage to house will also be taken from Bond. 6. Please respect the neighbours as parties, excessive noise and loud music are not tolerated. *See what our guests had to say below. "Although we chose the coldest week in decades during Winter to take a holiday, the unit was cosy, warm and had all the comforts of home. The welcome wine, chocolates just added that extra touch. We will definitely make a return trip in the near future. Thanks for being such great hosts." "We had such a lovely time in your beautiful townhouse. Never have we experienced such thoughtfulness and generosity in what has been provided to make our stay more comfortable. Thank you so much for providing such a clean, well-stocked home for both of us to really enjoy Vincentia and all it offers. Everything so clean and spotless. We will be recommending this gorgeous oasis to all our frineds at home". Tony & vicki, California, U.S.A.
"What a perfect home away from home. We love the decorative touches and all the little extras to make us feel comfortable. The beach is beautiful, perfect weather, beautiful home. What more could we ask for". "Although this is my son and my second time here, we were completely taken aback the minute we walked in. We all absolutely love the decor. Your choice of furniture and all the beautiful touches are just perfect. The townhouse has such a "homey" feel about it. We immediately felt totally at home. The beach is so close, the weather amazing. The children want to live here permanently. So do we!" "We have finally made it back to England from our wonderful holiday in Australia and I thought Id just write a quick email to say how much we enjoyed staying at your lovely home in Vincentia. We really appreciated how clean and comfortable everything was and your welcome basket was wonderful. Thank you! We travelled quite a lot during our visit and stayed in lots of different places including apartments, hotels, motels, houses and B&Bs, but your was the nicest". "Wow! What a beautiful place. The townhouse is just sensational. Everything was thought of to make our stay a joy! What a joy it views from the balcony were breathtaking and the beach was just stunning! The decor in the house is very tasteful and just adds to the "get away" feeling. My name is Margaret Hanley and I have been in the accommodation business for 19 years. I delight in providing very comfortable accommodation, with modern furniture. The townhouse has recently been refurbished, with completely new kitchen and appliances, new carpet, lounges, tiles and curtains. This property was chosen because Collingwood Beach is just steps away, ( no roads to cross) and next to the very popular Bay Bike/Walkway, leading one way to Huskisson's great Cafes, Boutiques, Cruise Boats, Clubs and Hotel. The other way leads to Vincentia's shopping precinct, with large Coles supermarket, and lots of different chain stores. I also love Bay and Basin Indoor Acquatic Centre with heated pools,, waterslide and Gym. The Bay itself is absolutely breathtaking. The spectacular views from the upstairs balcony and main bedroom, garden courtyard and the close proximity to both Huskisson and Vincentia. toilet, tub, shower, please note that there is a 1/2 bathroom on ground floor. 1/2 bathroom downstairs in laundry. Air conditioning up stairs. Electric & Fans & heaters Living room. Linen, Doonas, Towels. Beach towels, bath maths, hand towels & tea towels. 1 small garage suitable for small car or small boat. Small car garage with outdoor parking also. Small garden paved courtyard, with large table and six chairs. Bay views, table with 4 chairs. Had a fantastic time, exceptional location and beautifully kept townhouse just right for a family of four. Loved exploring the area and shall definitely return. Great location! Town House was very clean and comfortable! Great location, close to beach and cafes/restaurants. Would love to return one day! 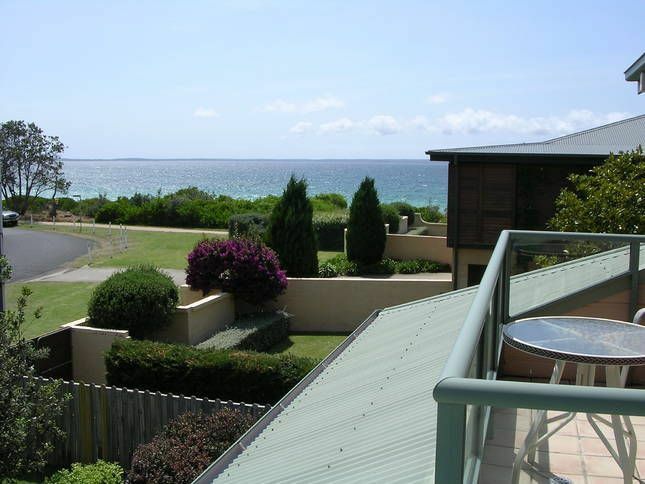 Robyn, we are so pleased you enjoyed your recent Getaway to "SeaChange", Jervis Bay. Thank you for leaving the townhouse as found, so clean and tidy. Love to host another visit if ever you are down this way. Margaret and Brian could not have been better hosts. We were met with fresh flowers and a thoughtful card celebrating our 40th wedding anniversary. We will definitely let everyone we know about this little gem. Again Margaret , thank you for making our stay so memorable. This property has a fantastic location being metres from the beach which is a great beach for swimming and walking. On arrival we were greeted with one of the cleanest and well presented properties we have stayed at. Every thing was thought about and it made for a pleasant stay. Thanks for the wine and chocolates it was a very touching idea Margaret. A perfect get-away for me: Beach on my door-step, National Park nearby and a friendly community. The property was beautifully maintained. We had everything we needed and more! It was evident that the owners cared for the property and their tenants. Can't wait to come back! Thank you Maria. We also enjoyed hosting your holiday at "SeaChange", Vincentia. We would gladly welcome back you and your cousin for another getaway in the future, as having such great guests is indeed a pleasure and something to look forward to. We have to thank Margaret for her warm and friendly Welcome. The Beach House is fully equipped and we didn't miss anything. you would be very welcome to once again stay at "SeaChange". Jervis Bay is a very popular beach holiday area on the South Coast of N.S.W. Australia. Just 2 1/2 hours from Sydney and 1 1/2 from Wollongong an the Southern Highlands, the area is famous for its Whale Watching Cruises and also for the resident dolphins which live in the Bay. Be sure not to miss the Booderee National Park, which contains the famous Hyams Beach, which boasts the whitest sand in the world.